Hello. My name is Angela and I’m a chocoholic. I’ll consume just about anything smothered in chocolate. I’ve even considered trying chocolate covered ants and grasshoppers (but haven’t actually done the deed yet). My Honey Badger’s Mom, however, isn’t a chocolate freak (which makes her a little odd and suspect to the rest of us, just so you know.) She is, however, a caramel lover. So, for her birthday, she wanted a caramel cake. Badger found a Trifle dish that he liked (Yeah, he actually does like things like this, which makes him awesome as a treasure hunting partner). He asked me if I liked it. I liked it, but I try not to accumulate dishes that don’t stack well, store easily and that have only occasional uses — it flies in the face of my living small tendencies. He asked me if I thought his Mom would like it. I told him that if he bought it, I’d make her a birthday cake to fill it. We carried it out of the store. By the time we got to the grocery store, I had less than an hour to bake, cool, frost and decorate the cake. There was NO WAY this was going to happen from scratch, so I cheated. I bought a pound cake (the round kind) because it was on sale (I’d probably use an angel food version, if I had it to do over.) Then, I dashed around the store looking for layers to use to create an impressive caramel birthday cake. 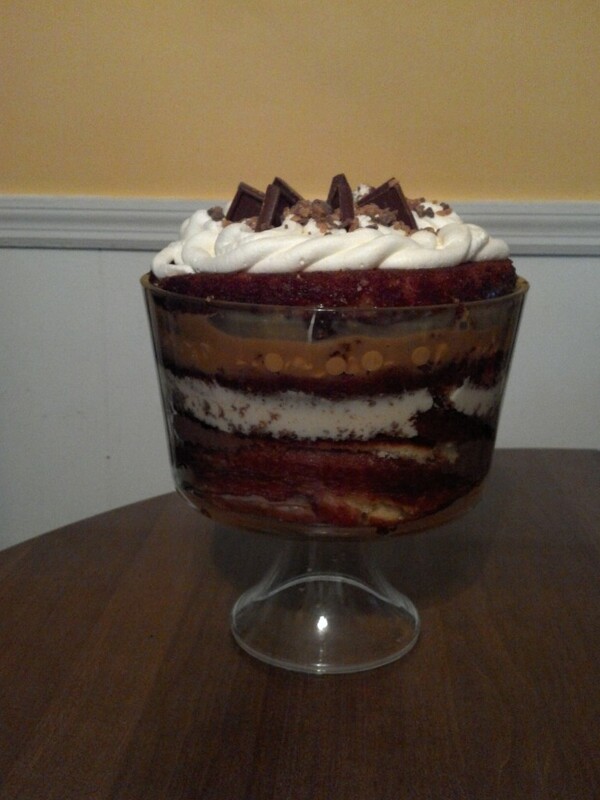 The result was a 13-layer trifle literally erupting with caramel and butterscotch flavors (with just a tiny bit of chocolate for the Badger to enjoy). 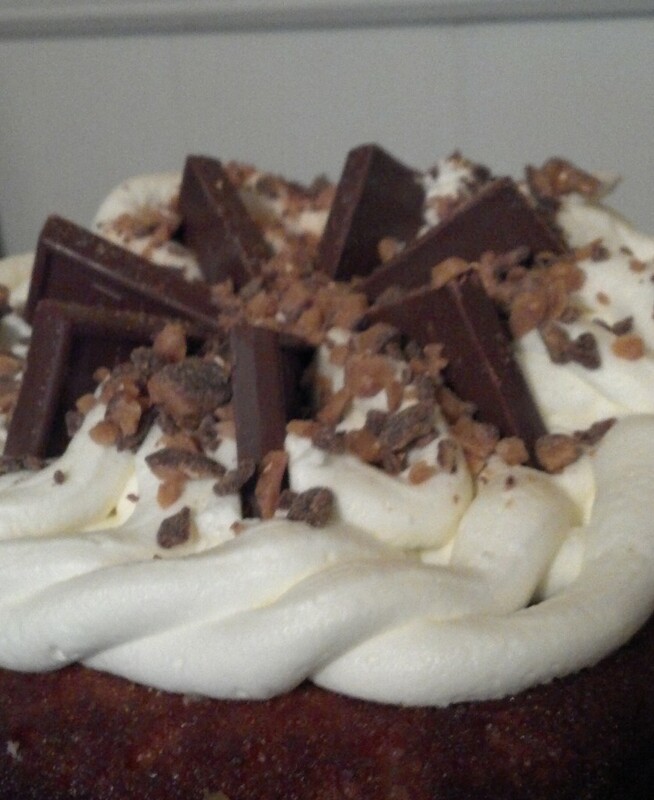 Whipped cream topping with Ghirardelli brand carmel filled chocolate squares put in the cream corner down and a sprinkling of Heath bar crumbles to garnish. I think the thing weighed about 10 pounds. Seriously. I had to slice the cake carefully, and then remove a section (of a different size each time) of each slice to make it fit properly in the trifle bowl (which flutes OUT as it goes up). My Nephew Has Been Named and Is Due In SIX WEEKS! 2 Responses to "Do Not Trifle With A Carmel Lover!" 🙂 Why, THANK you, Honey Badger! I didn’t know you did any lurking over here. What a pleasant surprise!